WASHINGTON, DC, September 7, 2016 (ENS) – A federal judge Tuesday declined to halt construction on a part of the Dakota Access oil pipeline route west of Lake Oahe that the Standing Rock Sioux Tribe has recently identified as sacred burial ground. A confrontation erupted as the site was bulldozed on the Labor Day weekend by pipeline construction crews. At the request of U.S. District Judge James Boasberg, the company, Dakota Access LLC, agreed to halt construction on an area east of Lake Oahe until a separate ruling, due shortly, is issued on the preliminary injunction motion in the litigation brought by the tribe over the pipeline. The 1,168-mile Dakota Access Pipeline would carry roughly 570,000 barrels of crude oil a day from North Dakota to Illinois. A portion of it passes through the Standing Rock Sioux Tribe’s ancestral lands, and near the border of the tribe’s present-day reservation. The $3.8 billion pipeline would carry fracked crude oil more than 1,100 miles through the Dakotas, Iowa and Illinois. The 30-inch diameter pipeline will connect the Bakken and Three Forks production areas in North Dakota to an existing pipeline in Patoka, Illinois. Critics warn that it would cut through farms, sensitive wildlife habitat, the Standing Rock Sioux’s ancestral lands, and the Missouri River, the primary drinking water source for local communities. A pipeline crossing, to be built under the Missouri River just upstream of the reservation, puts at risk the water of thousands of people who depend on the river. The Standing Rock Sioux fear the Dakota Access Pipeline will damage their drinking water. They worry that an oil spill that could be culturally and economically catastrophic. A Spirit Camp, where Standing Rock Sioux Tribal members are gathered with other supporters in prayer and solidarity, has been created at the confluence of the Missouri and Cannonball Rivers. Known as the Camp of the Sacred Stone, this gathering was not organized by the tribal government, but other tribal members and supporters from around the country have come to join the gathering. 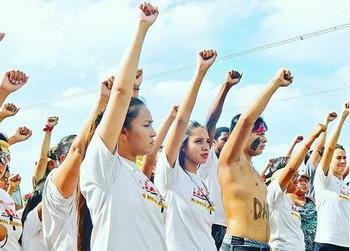 From this camp, a group of Standing Rock Sioux youth and their allies embarked on 1,800 mile relay run from North Dakota to Washington, DC, to hand-deliver a petition asking the U.S. Army Corps of Engineers to deny the key permits for the pipeline. On Saturday, in a confrontation near the Cannonball River, security guards working for the pipeline company attacked Native American anti-pipeline demonstrators with dogs and pepper spray as they resisted construction of the pipeline. A pregnant woman was reported to have been among the several people bitten by security dogs. People of all ages, including a young child, were pepper sprayed in the face. A demonstrator was tackled and slammed to the ground by a company worker. The Standing Rock Sioux Tribe is doing more than just demonstrating against the pipeline. Represented by the public interest environmental law firm Earthjustice, the tribe filed a federal lawsuit on July 27, challenging the U.S. Army Corps of Engineers for issuing a permit for the pipeline construction in violation of federal laws. Filed in U.S. District Court in Washington, DC, the tribe’s lawsuit contends that the Corps approved construction of this pipeline without adequate environmental reviews and without adequate tribal consultation. “There have been shopping malls that have received more environmental review and Tribal consultation than this massive crude oil pipeline,” said Jan Hasselman, an Earthjustice attorney representing the tribe in the litigation. Senior officials at the U.S. Environmental Protection Agency and two other federal agencies raised environmental and safety objections to the North Dakota section of the pipeline, the same objections expressed by the Standing Rock Sioux tribe. Originally, the pipeline was planned for another route, says Earthjustice. The original route crossed the Missouri River upstream of Bismarck, the state’s capital city. An oil spill at that location would have threatened Bismark’s drinking water supply. 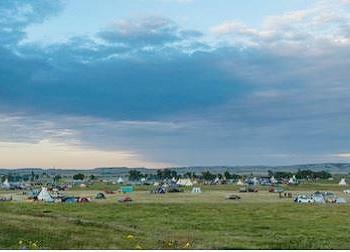 The pipeline route was moved south, to just a half-mile upstream of the tribe’s reservation. The land the pipeline crosses had been taken from the tribe in 1958, without consent, by the Corps for a dam project. “When the pipeline leaks, the Missouri river – the source of our drinking water, where we fish, swim, and conduct ceremonies – will be contaminated,” Archambault said. on the reservation still use well water.’ Most members actually live in districts, not rural areas, and rely on MR&I water drawn from the river, not well water,” declared Archambault. “The pipeline will reduce the current use of rail and truck transportation to move Bakken crude oil to major U.S. markets to support domestic demand,” the company says. The pipeline would transport approximately 470,000 barrels per day with a capacity as high as 570,000 barrels per day or more – which could represent roughly half of Bakken current daily crude oil production. Energy Transfer Crude Oil Company, LLC is developing the pipeline to provide crude oil transportation service from Patoka, Illinois to crude oil terminals at Nederland, Texas. Shippers will be able to access multiple markets, including Midwest and East Coast markets as well as the Gulf Coast via the Nederland crude oil terminal facility of Sunoco Logistics Partners. One remaining authorization still has not been issued. Because the Corps owns land on either side of Lake Oahe, Dakota Access must get an “easement” from the Corps to dig the tunnel for the pipeline underneath federally owned lands. Under law, the Corps must give Congress notification of its intent to grant such an easement, and then wait 14 days after giving notice before issuing the easement. Dakota Access only needs the easement for the drilling underneath Lake Oahe; it has permits to construct everything else, such as the access road and pipeline route up to the Lake Oahe crossing site. Earthjustice is asking the Corps to hold off on issuing the easement until the issues in this case can be worked out.